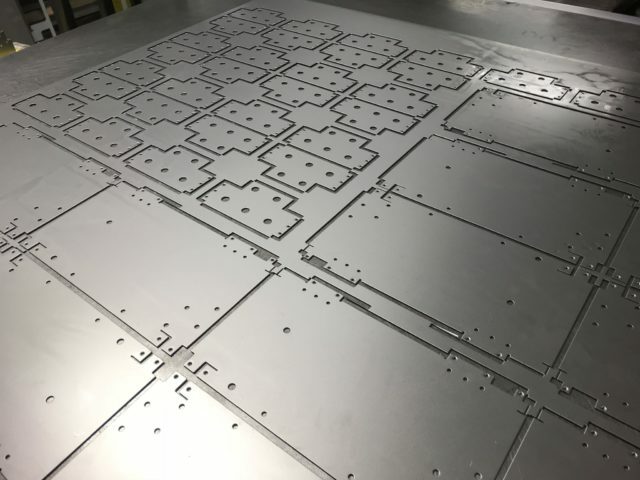 What is CNC punching when it comes to sheet metal work? 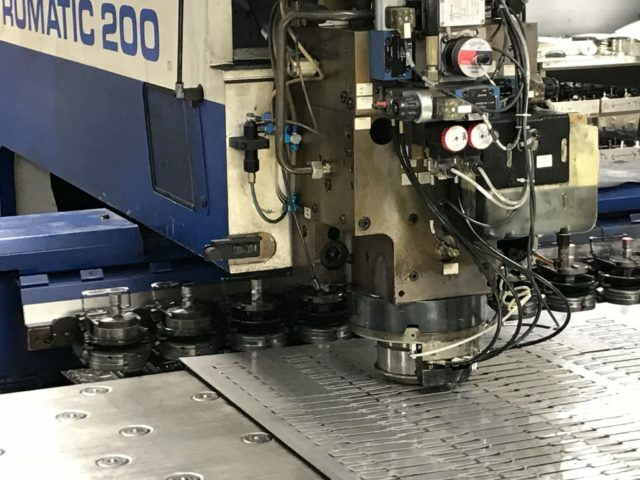 With impressive productivity and numerous special CNC punching features the Trumpf 3000R CNC punching machine can take your sheet metal fabrication designs to a new level. Sheet metal CNC punched parts can be produced with CNC formed up or down extruded plunges and formed threads, small bends and mark free edges within the CNC punch press punching cycle time. 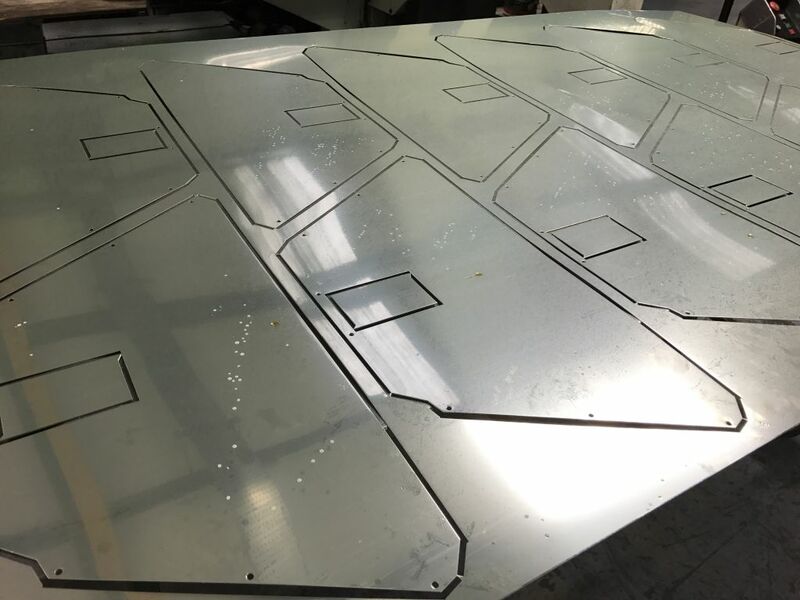 Your sheet metal work can include high speed CNC engraved part numbers, logos or product identifications. 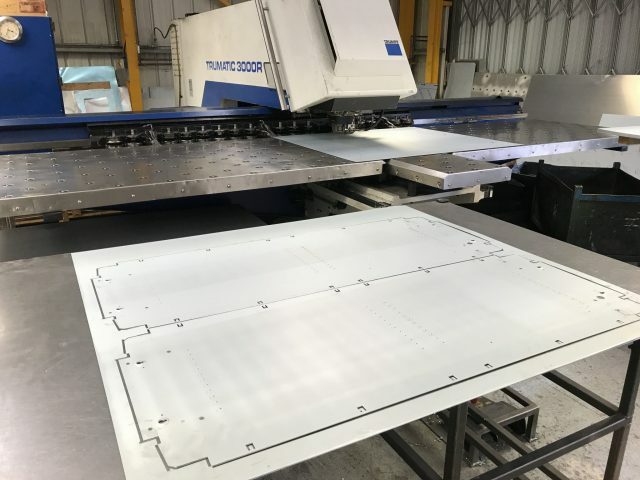 CNC punching sheet metal work can also produce ventilation louvres, built in hinge features, electrical knockouts forms and countersink forms which can all be manufactured to your bespoke sheet metal fabrication designs. We work closely with Trumpf to source the best tooling to produce your sheet metal components with the least fuss and up front tooling costs. Being able to process components from sheet metal materials from as thin as 0.4mm right up to 6.0mm thick in a of materials ranging from mild steel, zintec coated mild steel, galvanised steel, stainless steel, aluminium alloys, copper, brass and pre-painted mild steel allows us to offer you a very powerful and flexible manufacturing service. Sheet metal work produced by CNC punching has never been so easy from prototypes and small batches to high volume production. 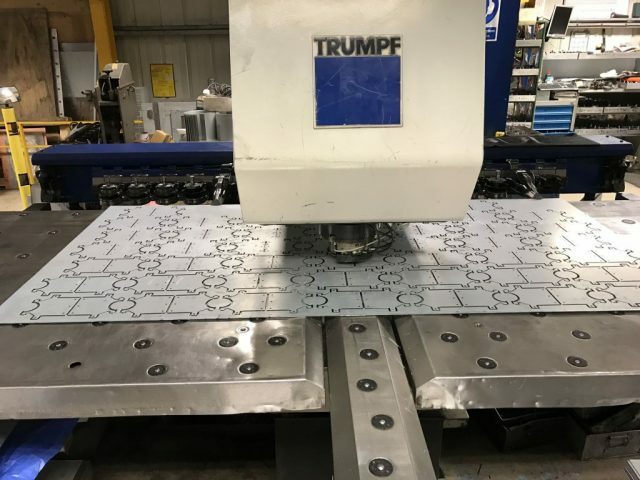 The single CNC punching head on both our Trumpf CNC punch presses enable us to reduce set up times to just a few minutes between jobs enabling small batches to be run at very competitive prices, ask for a quote and see how this can benefit you. The single head design also allows all tools that are loaded into it to rotate 360deg enabling very complex designs to be manufactured with ease and with less tool changes than any standard turret style CNC punch press. This flexibility also allows us to interlace sheet metal component parts within whatever sheets of metal we use to get the highest possible material utilisation. 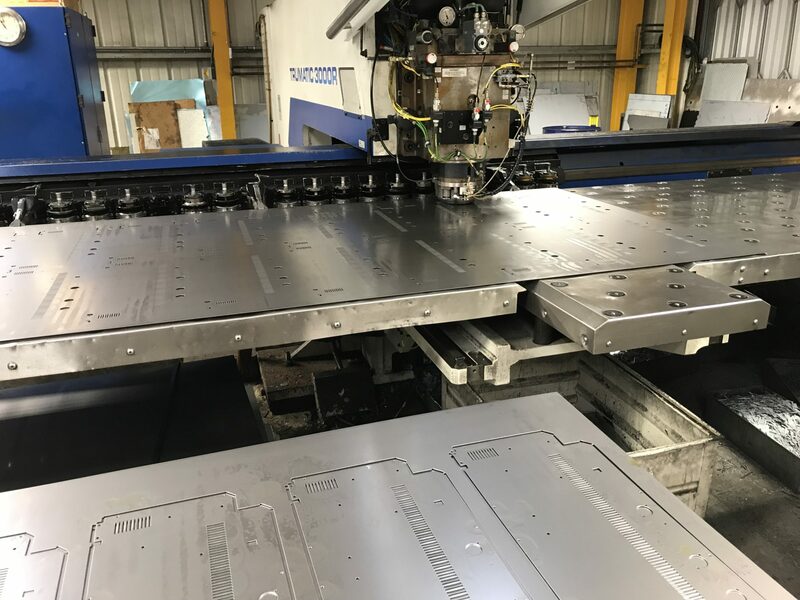 This manufacturing flexibility is a major benefit when producing sheet metal work for special projects or low volume products and is passed onto you in lower prices but at no reduction in the quality of the sheet metal fabrications produced. The ability of our Trumpf 3000R CNC punching machine to completely CNC punch a sheet with no tool clamp zone produces great material savings. This high material yield in today’s increasingly competitive market can be a great price advantage for you. 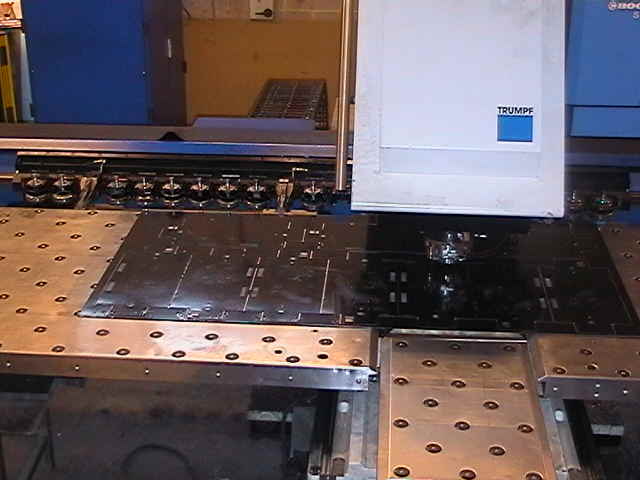 A CNC punching machine like the Trumpf 3000R needs powerful CADCAM software to get the very best from it and V and F Sheet Metal provide that with the complete Radan® CADCAM software suit. 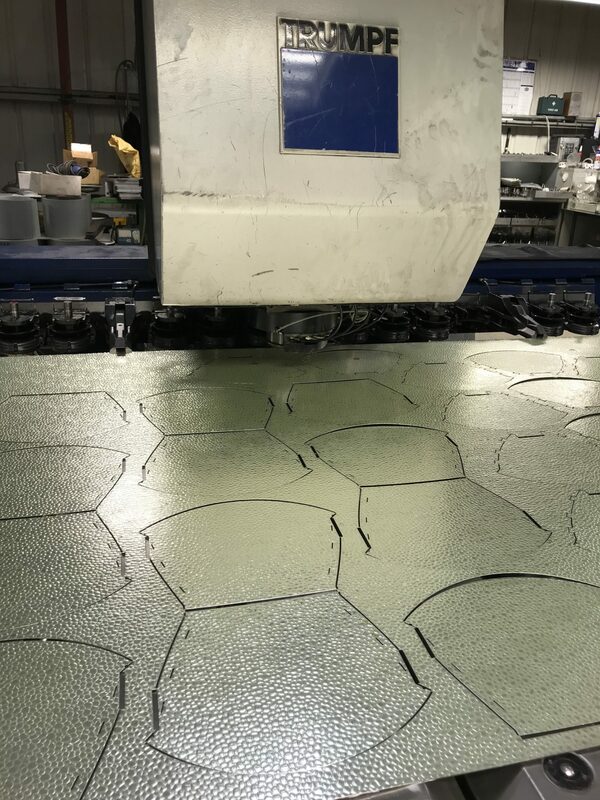 To learn a little more about our Radan software and the advantages it allows us to bring to you please see our pages on Radan® and designing for CNC punching. Please visit our specific design pages showing examples of real sheet metal fabrications and the steps we have been through is turning a 3D software model into the final fabricated sheet metal component, in this case a sheet metal fabricated box. 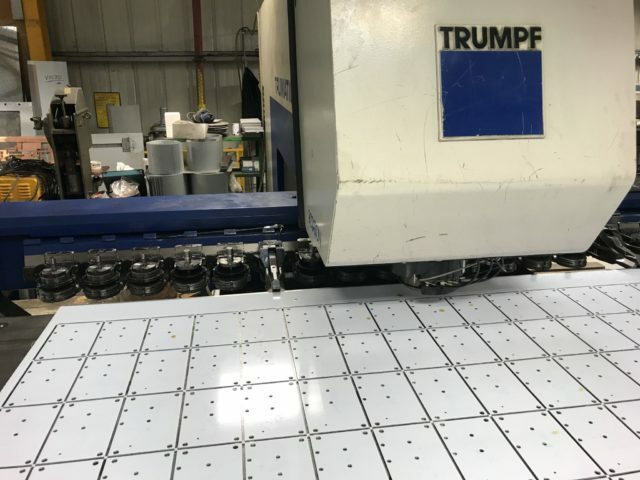 Trumpf CNC punching of sheet metal work - CNC manufacturing technology. With both machines sharing the same tooling we have increased flexibility when running production orders to suit our customer’s urgent requirements. CNC punched nest of sheet metal anodised aluminium reflectors for interior light fittings. Notice that the components share a common long side, “common line cutting”. This saves on material and reduces the amount of time to CNC punch = cheaper parts. 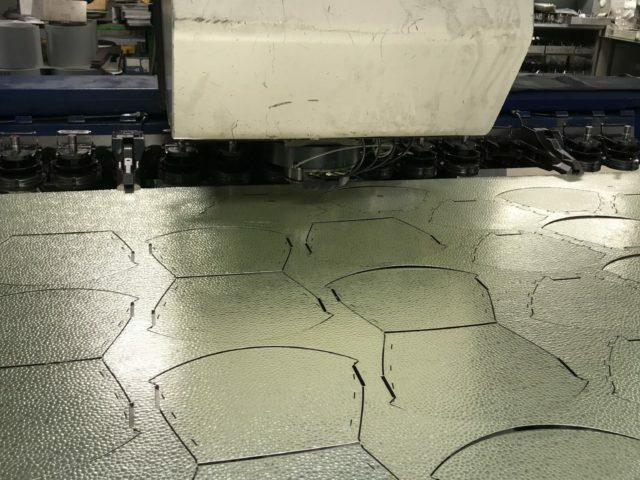 CNC punching stainless steel sheet metal with a protective plastic film on our Trumpf 3000R CNC punch press. The plastic film acts as a protection against dirt, oil and scratches. It can be peeled off whenever needed during the production process or by the customer in assembly. CNC punched perforated circular hole pattern in 2mm thick CR4 mild steel. 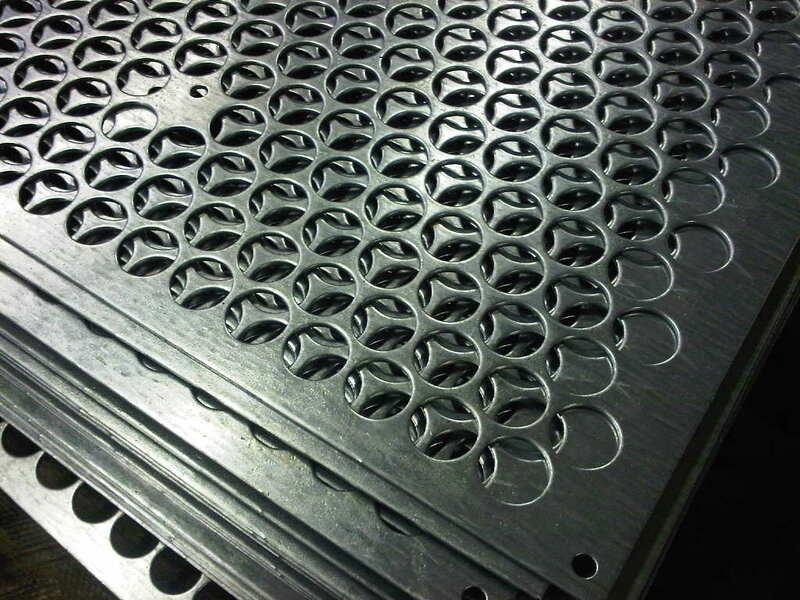 The ability to manufacture bespoke grille patterns for audio and heating applications is typical for CNC punching. Trumpf 3000R CNC punch press punching circular gear trays from pre-painted steel. The curved outer profiles are being produced with bespoke "banana" curved shaped tooling. The final piercing will free the component from the sheet and enable it to be collected through a chute in the machine bed. Trumpf 200 CNC punch press punching zintec motor mounting brackets from a full 2M x 1M sheet of material. Full nest of sheet metal components CNC punched and tagged in position. These parts were CNC punched from 2mm Zintec coated mild steel and used to support electric motors in a heating unit. CNC punched lighting reflectors still in their 2000 x 1250 sheet. These lighting reflectors are supported in the sheet with just 0.1mm tags. Once the sheet has been shaken a little the components will simple fall out of the parent nest and be ready for CNC bending. CNC punching on our Trumpf 200 with the hood up. You can see the single punching head. This allows all the tools that are loaded from the back tool rail to rotate through 360 degrees. A great advantage when it comes to producing complex sheet metal parts with many features at different angles. 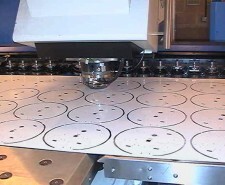 CNC punching lighting reflector components from Alanod 0.4mm thick pre-anodised 33PG material. The components are easily broken free from the sheet nest and off to folding. 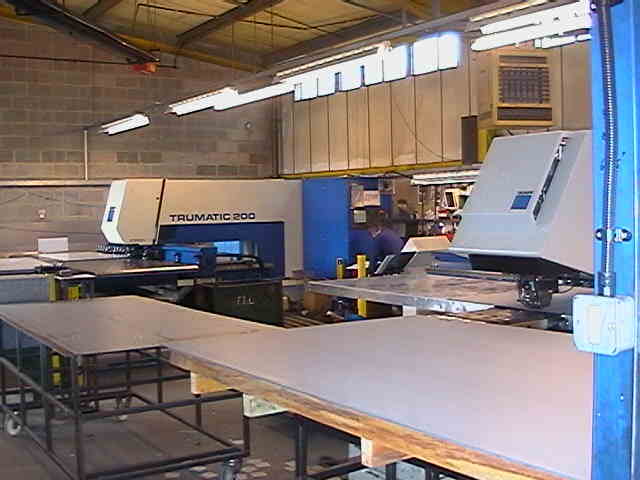 Here’s our Trumpf 3000 producing large panels (2 from a 2M x 1M sheet). The Trumpf 3000 can CNC punch holes all over a 2.5M x 1.25M sheet without having to reposition the sheet. This allows us to maintain a better accuracy on larger components. Stainless steel brackets produced with a series of basic standard rectangle tooling. A good example of common line cutting and efficient CNC programming to get the best yield form a sheet of material. Here is a nice example of CNC punching different parts on the same sheet. 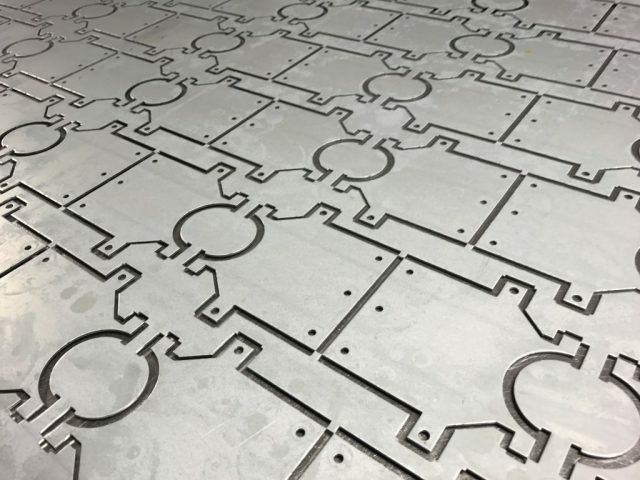 Using CNC programming to layout different parts on the same order enables efficient planning for production and often free parts from what could have been scrap materials. 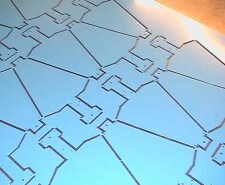 CNC punching 0.9mm Zintec panels from 2M x 1M sheet. 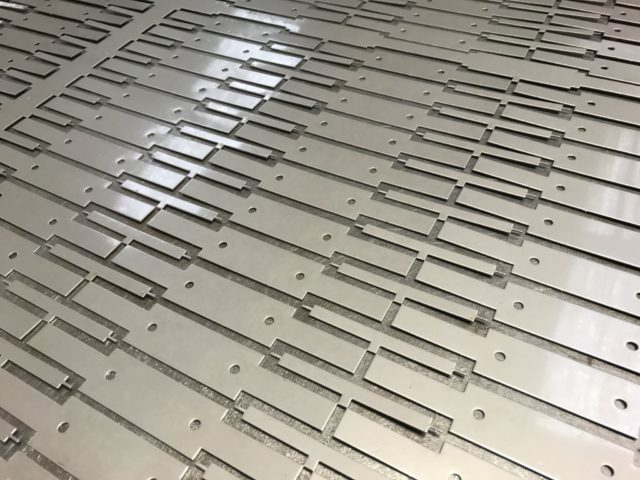 These parts are run in batches of 250 parts at a time and they are an ideal example of a CNC punched project. 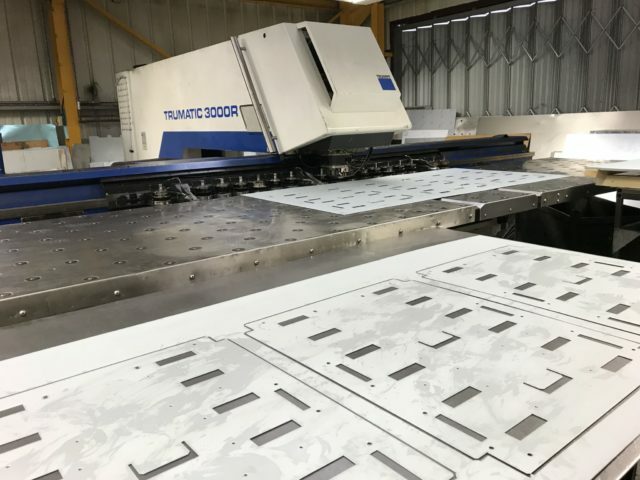 Our Trumpf 200 CNC punch press punching out 3mm aluminium panels with a white plastic protective film. Common line cutting in the X and Y axis to save money and time in production. Trumpf 200 punch press with the cover up punching mild steel covers. The ventilation slots shown in the covers are being CNC punched with cluster tooling to save time and money.